Oriental Fruit Moth (OFM): Applications made for the first generation are now over in all counties, unless trap counts exceed 6 moths per trap. The second generation flight should start in about a week to 10 days with controls targeted starting about mid-June in southern counties. Plum Curculio (PC): PC adults are still active throughout the state and laying eggs. Orchards in northern counties which have high populations, also have fruit with fresh egg scars and eggs still present. 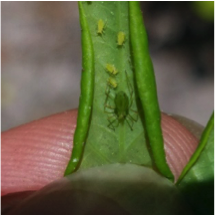 Green Peach Aphid (GPA): Scattered adults are being seen, particularly in northern orchards, but no orchards have populations that need treatment. San Jose Scale (SJS): Scale crawlers usually emerge about the first week of June. While it is too early for control, growers may wish to be prepared if you had seen high populations of scale last year: If you have scale infestations on your trees, it is important to note if crawlers are present, even if you treated with oil in the early spring. If crawlers are present then treatment options include Esteem, Movento, Centaur, Venerate, and Diazinon. Esteem, Centaur, Venerate and Movento should be applied at the beginning of crawler emergence. Venerate needs to be applied twice during the crawler stage. Diazinon is labeled for only one post bloom or foliar application on stone fruit (Rec = max. of 2 lb/acre of the 50W). The apple label allows up to 2 foliar applications per year as long as a prebloom application was not made. The peach label allows 1 foliar application per year. Foliar applications may cause russet on apples, but has worked in the field for scale crawlers as long as applications are made 1-2 weeks after the start of crawler emergence and again 2 weeks later. Brown Rot; Anthracnose: Thundershowers and overhead irrigation done around periods of warm temperatures and high humidity can provide good opportunities for brown rot infection, particularly in blocks with damaged fruit or blossom blight. Brown rot is present in the field, seen on cherries this week. Use an improved fungicide program (not sulfur, but captan mixes or alternations) during favorable weather conditions as we have been having. On all varieties, an improved fungicide schedule should be initiated 2 to 3 weeks prior to the first picking. Pay attention to susceptible varieties such as white peaches. While cover sprays are important, the most important timings are early preharvest sprays starting 4 weeks before harvest. Pristine has been very effective based on past experience. Merivon should be equally effective although data is lacking. Gem has not provided adequate control in the field. The QoI component of Luna Sensation has the same active ingredient as Gem, but it is not known how effective Luna Sensation would be for anthracnose. Bacterial Spot: Leaf symptoms have been seen in only a few locations and only on highly susceptible varieties, the current wet cycle may have initiated additional infections so look for leaf symptoms to appear this week, and fruit symptoms to appear in about 2 weeks. Fruit remains highly susceptible until pit hardening so management practices should be continued. Rusty Spot: Symptoms are appearing in the field now in southern counties. Maintain control measures until about pit hardening. This is another area where having flowering weeds in your ground cover is a bad thing. DMI fungicides (Rally; difenaconazole) are the current standard rusty spot controls, but if combined with a neonicotinoid insecticide for insect control, you have a toxic combination for bees. If you have a weedy ground cover and use a neonic (Admire, Actara, Assail, Belay, or premixes that contain neonics, then consider using one of the biorationals (Armicarb; Kaligreen; Serenade) in place of Rally to minimize impact on bees. However, the biorationals alone are not as effective, so get rid of the weeds with a broadcast application of Stinger. Fire Blight: We are now in the shoot blight phase of the epidemic. Sanitation is important both to remove inoculum and to help prevent bitter rot inoculum buildup. Instructions for deciding when and how to cut out fire blight strikes can be found on page 7 of the UMASS bulletin, “An Annual Program for Fire blight Management”. Pear Psylla : Pear Psylla nymphs have begun to hatch and adults are still laying eggs for the second generation of nymphs. Control of this generation is important to avoid overlapping generations throughout the summer. Scout the growing tips for eggs. Eggs are usually laid along the center leaf rib mostly on the leaf underside. Applications of 1 % summer oil in early cover sprays have shown to be of benefit. Use oils and adjuvants with caution on Asian varieties. When applying insecticides for psylla control, timing is important as materials such as Movento and Agrimek should be applied when the first eggs hatch. In the case of Movento application a few days before hatch is better, since this material takes some time to move into the tissue. Add penetrants as per label instructions. Delegate and Neonicotinoids may also applied when the first eggs hatch. The addition of 1 qt. summer oil or a non-ionic surfactant will improve control with these materials. Finally Sivanto, a chemistry closely related to neonicotinoids is effective but should be used with oil as per label instructions. Some miticides such as Portal and Nexter are effective, but should be applied when most eggs have hatched but before any nymphs begin to form wings. Centaur has provided excellent control where used even on later instar nymphs. Disease management for Phomopsis and Anthracnose remain the main focus driving pest control programs. However in southern counties growth is progressing rapidly so that management for black rot, downy mildew, and powdery mildew should be considered. As we approach bloom we enter a critical period for controlling botrytis and fruit rots. Consult the Commercial Grape Pest Management Recommendations for New Jersey for recommended materials and rates. Mizuho Nita at Virginia Tech discusses disease management at bloom in his recent blogpost. Grape Berry Moth (GBM): GBM begin flying about the time the earliest wild grapes bloom. If you are monitoring for GBM place your traps now. Since this is an edge pest we typically place traps along a wooded edge of the vineyard, as well as one in or near the center. The edge traps give you an idea what your population pressure is coming in from outside while the center trap tells you how many are spreading from the edge into the vineyard. The goal of managing berry moth is to control the population on the edge to keep it from moving into and throughout the vineyard. We use a degree day model to time sprays. It’s important for growers to set their own biofix to properly use the model since berry moth is keyed into whatever wild grape species are present near the vineyard. Locate and mark wild grape vines and set your biofix when the first flowers appear. Degree days can be tracked using the weather data nearest you at the NEWA website. Cranberry Fruitworm (CBFW): Adult activity in Burlington County is still slightly higher than in Atlantic County, however we did not see a peak in adult activity this past week. According to a recently developed model for cranberry fruitworm, egg laying occurs from about 85 degree days (base 50) through 400 degree days after biofix or the first sustained moth catch. We found our first adult on May 14 in Hammonton. Therefore, according to the model, eggs started to be laid about May 14 and should continue through about June 5-7. Freshly hatched larvae enter the fruit near the calyx end shortly after egg hatch. Therefore the most effective treatments target newly emerged larvae before they can enter the fruit. The first post pollination treatments for PC also targeted these newly hatching larvae. However, since the egg laying period is ongoing an additional treatment is needed at the present time. At this time the best material that works for BOTH Cranberry Fruitworm and PC is Imidan. Other materials that can be used to control both pests are: Asana, Avaunt, Brigade/Bifenture, Danitol, Diazinon, and Hero. Leps- Leafrollers, Worms: Numbers per bush increased slightly over the past week, largely green fruitworm and other assorted caterpillars. Our average count was 0.044 per bush, with a high of 0.5 larvae per bush. This is well below the treatment threshold of 1 larva per bush. Separately, on developing lower shoots, lower infested shoot it was 0.148 per infested shoot with a high of 6 percent of LEPS on shoots. The level of injured fruit was very low at 0.102 per bush with a high of 1.1 infested fruit per bush. Aphids: Aphids started to show up by mid May, averaging 0.038% shoots infested, with a high of 2% shoots infested. Levels increased over the past week averaging 0.831% shoots infested, with a high of 12%. Colonies are small, sometimes consisting of only single aphids. However, since our informal treatment level is 10% infested shoots/bush, we are approaching treatment levels on a number of farms. As of this writing, aphids are now reproducing and colony size is increasing. If you carefully examine tender grower tips, both adults and nymphs can be found in growing colonies (Figure 1). Materials that work for both aphids and cranberry fruit worm include: Assail (stronger on aphids), Lannate (stronger on fruitworms), Diazinon (weak on aphids), Brigade/Bifenture, and Hero.